Streets were as usual so packed with motor bikes of all sort ridden by Vietnamese in helmets, dodging in and out of us and each other like a superstar soccer player trying to get the ball to the goal. Here in the city of 34 streets with giant almond and banyan trees like umbrellas for shade we watched business come to life, quickly, early. Each street were once designated spaces for the trade guilds and they range from shoe street to herbal medicine street, to sugar, basket, scarf, fan, silk, cotton, fish sauce, wood altar, prawns, lacquer, tin, frame, electronics, bamboo ladders, bird house, bonsai, house plants, tea string and tape street, paper street, and so on. It was a challenge to identify where we were, but there was always something funny, unique and quizzical to watch. People do normal things and are friendly wherever they are. 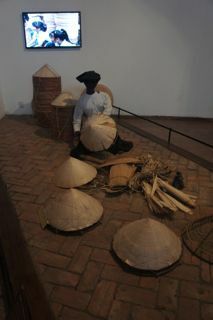 Our destination on our last day was to the Ethnology Museum and 54 Traditions Collections of Vietnamese Minority Art. The title alone was enough to make me wonder could it be true but this is the only Gallery in Vietnam which brings together all the artifacts of the 53 minority groups and the Kinh majority people. Vietnam is very divided into tribes and sections which are an amalgamation of the fascinating 2000 year history. Is there a pure Vietnamese tribe? That would be hard to define as this country’s valuable shore line was continually coveted, peppered, attacked, abused, and overrun by China, France, a bit by America and many other feudal lords and kings in the founding days. Always it has remained primarily Buddhist in faith, with fringes of animism. And somehow it has survived, stronger, more fascinating and welcoming than any other in Southeast Asia. And now there is peace and prosperity on the march. 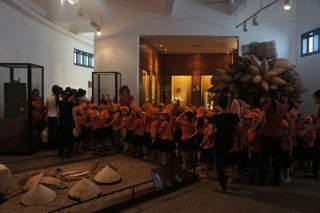 As we arrived at this extraordinary museum, once again we confronted hundreds of precious children surely between ages of 2 and 6 who were being led like charms on a chain bracelet through the various displays of the museum. All were dressed in orange T-shirts and caps (surely not U-T fans) and gaggling and laughing and pulling each other’s shirttail-skirt to stay in line. Lots had their caps cocked to one side. I pray it had no meaning, as in Memphis. It always cheers me up to see such young children learning their colorful history. We need to do more of this culture thing in Memphis. The diamond in my visit was being escorted by Dr. Mark Rapoport, an American pediatrician turned specialist in cultural art and history of the 54 tribes. 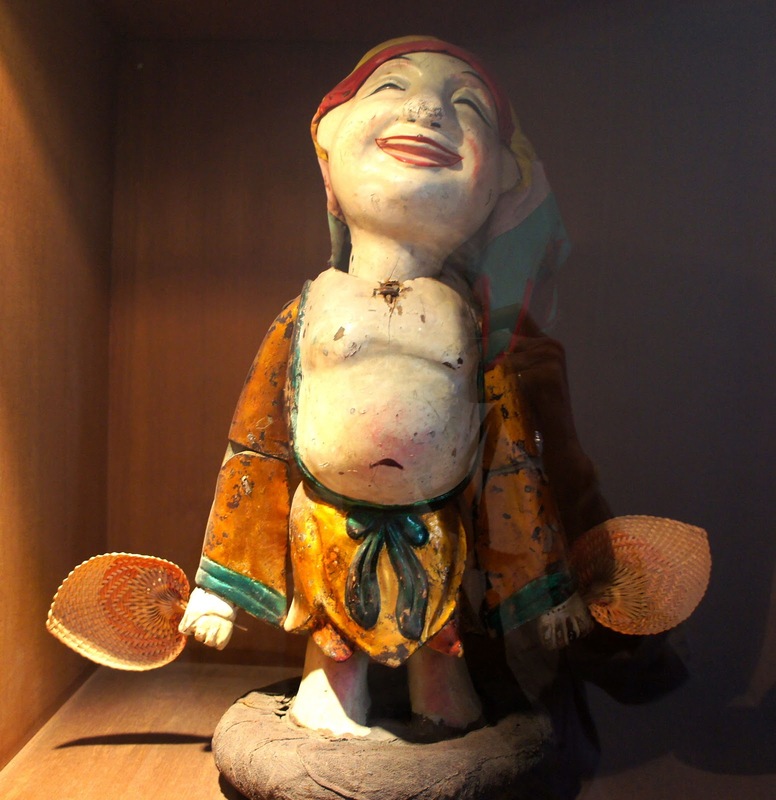 He and his wife also run (in another location) a shop filled with authentic museum quality antiques from these tribes and by the time one leaves, she is injected with the same enthusiasm of the pursuit of utility with beauty in each of the tribes. I love traditional costume and no matter what the task, the labor, the problem, women wear their costumes day in and day out in the hill countries. (In the cities, it’s modern Vogue and comfort). 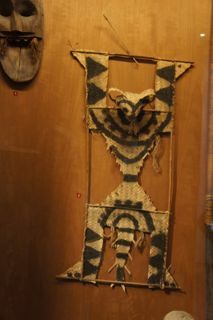 As we walked through the categories: Central Highlands, Tribal Textiles (amazing), The Shamanic Tradition, Functional Objects, Water Puppets, weaving traditions, etc., Dr. Rapoport’s enthusiasm, knowledge and passion was contagious. 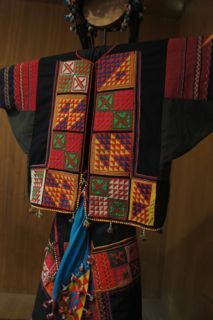 Some examples: seeing the process of making the Nung bamboo and rattan conical hats that everyone, including tourist wear; the Hmong of the highest mountains of north Vietnam make finely pleated skirts out of hemp and indigo dye; the Lolo tribe (of Tibet and Burma inheritance) women wore the most exquisite attires of what is called “reversed applique” and each one is a credible colorful work of art; the basketry of so many can be a bird or a rat trap but each one looks like a creative sculpture because, as Dr. Rapaport said, an useful object such as a coconut scraper or a woman’s smoking pipe (in the hill country women are tobacco smokers and also, like most, put great emphasis on the beetel nut, which turns their teeth black for beauty over the years,) has just as much value as something pleasing to see as it is being used. 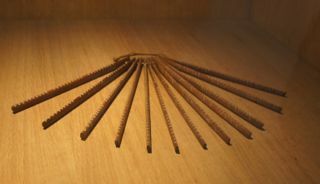 A buffalo horn depending on which end is kept open can be a powder keg, a wine holder and filter, or a trumpet. Time and time again he pointed this out in tools, baskets, and instruments like zithers and gongs and huge metal drums. The bright red ensemble of the Hoa (ethnic Chinese) wedding dresses is to bring happiness, good luck and prosperity to the couple, who are still traders in the Saigon area. The Behnar communal house rather than being just utilitarian, soars to heights of a temple at least 19 meters at the apex of the roof, all out of straw because it symbolizes the power of men. 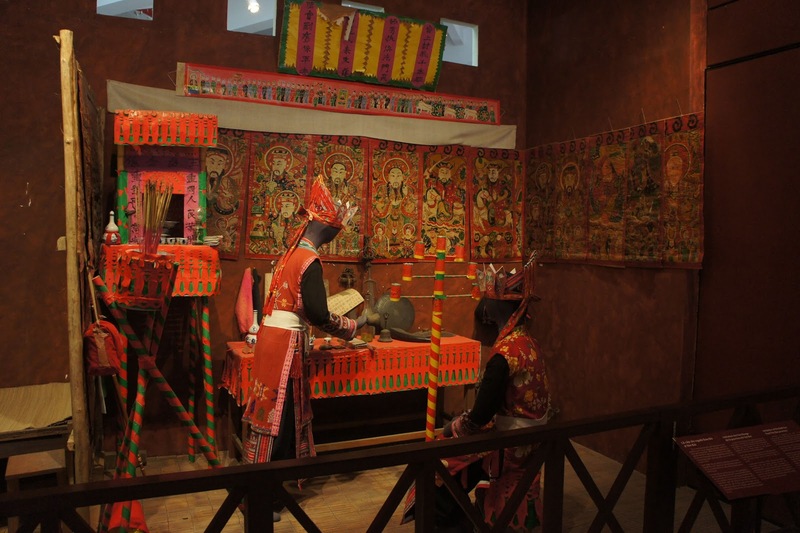 We also saw tomb of the Giarai people encircled with wooden figures with sexually explicit carvings like those of pregnant women and other fertile activities. There is also a stamp (stamps out of wood were big) carved with the image of the thunder god who works in healing. If this is stamped or tatooed in red ink on someone’s skin, it tells the god not to waste time making this guy sick. He’s protected. But my favorites were the shaman displays - the Shaman’s “doctor’s” kit with the usual teeth and stones and ornate cap and the shoulder “adze”, ring and gastrolet. A shaman situation has been created where everything is made of paper, the costume of the shaman and the ancestor, the wall drawings, and most objects are as well to emphasize the impermanence of life and that when the ceremony for the ancestor was done, everything would be burned to send the spirits up to the happy relative in the heavens. Like this. It has a touch of the Day of the Dead activities in Latin America. I received so much information from Dr. Rapoport - with his American take on cultures he loves - that I couldn’t get it all down. But this was one of the best museums I’ve passed through and my imagination is richer by the encounter, as I hope is that of the many little ones who were also visiting that day. 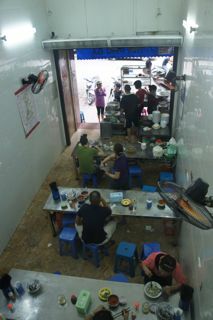 As a final adventure in Ha Noi (as Dr. Rapoport writes it) our guide took us to a street side Pho house so we could finally lunch on the most famous meal of regular people. 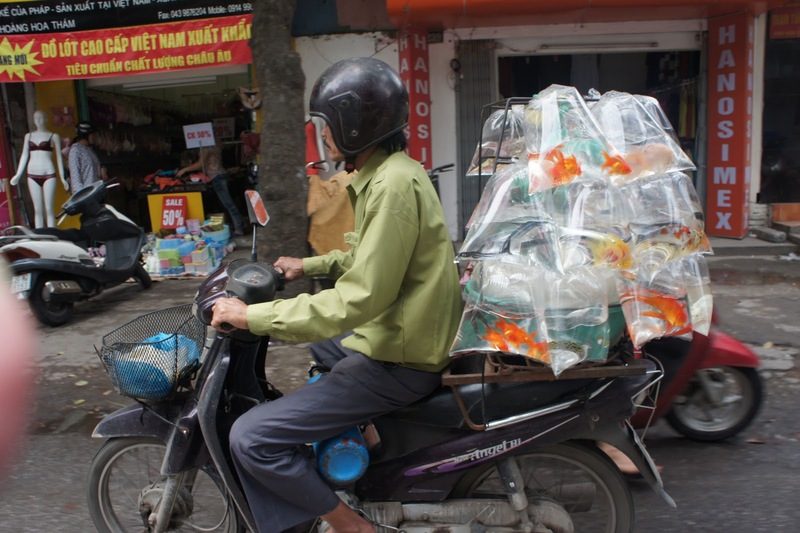 Pho is eaten daily and it is said to be better in Ha Noi than anywhere. It is a large bowl of tasty broth into which greens (like spinach, morning glory, etc) and green onions and fresh rice noodles are soaking. Meat or chicken are included for the non-vegetarian. The eater adds peppers, tamarind, lime juice, fish sauce, and spices as well. It was delicious and filling. I’m not a pasta eater but this one I could handle. Your blog is phenomenal - your calling is to travel and write - Contact National Geographic! I love reading your insight - Rain here and Maxine Smith died - the end of an era!